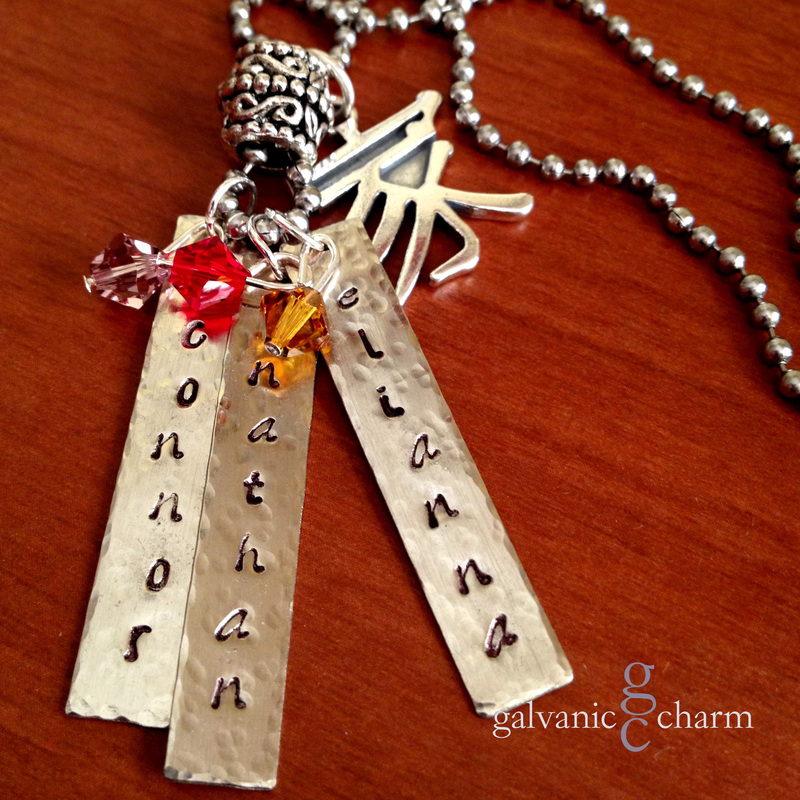 FAMILY – Mother’s necklace with 3 hand-stamped distressed stainless steel tags. Sterling silver Chinese “family” character charm, moonstone, ruby and topaz Swarovski crystal birthstone drops, and intricate pewter bead. 20″ stainless steel ball chain. $80 as shown. Alicia has a fabulously talented family, her mother is the Minnesota Poet Laureate, and her kids are musical, athletic, and smart. Two of them attend an area Chinese immersion school, and they just returned from a summer trip to China. When she wanted something that symbolized “family” in Chinese, I was more than happy to look for something that would reflect their worldly background! In addition to the Chinese character charm, the distressed stainless steel tags are imported from Israel, and the Swarovski crystal birthstone drops are from Austria to round out the international flavor of this piece. Order your custom design on Etsy, or simply message me, leave a comment, or send an email!